Eden Phillpotts' comic play The Farmer's Wife, based on his earlier 1913 novel Widecombe Fair, was originally staged in Birmingham in 1916. When it transferred to London in March 1924, it proved to be an enormous success and ran for over 1,300 performances at the Court Theatre, eventually ending it's run on 29th January 1927. The huge success of the stage play meant that a film version was almost inevitable and speculation in the press as to who would direct the screen adaptation was ended when it was announced at the start of June 1927 that Hitchcock would make the film for British International Pictures. It was also announced that Phillpotts was personally "re-writing, re-shaping and expanding the plot of The Farmer's Wife himself, ready for the screen version". ...a textbook example of intelligent adaptation, combining boldness with sympathetic fidelity. [...] As he had done in adapting Easy Virtue, Stannard constructs a lengthy new opening section, compresses the time scale, and cuts out several supporting characters..."
Stannard also wrote a second scenario based on original Phillpotts novel for British International Pictures around the same time as the one for Hitchcock. Directed by Norman Walker, this was released as Widecombe Fair in 1928 and starred Wyndham Standing, Marguerite Allan and William Freshman. Established film actors Jameson Thomas and Lillian Hall-Davis were cast in the lead roles of Farmer Sweetland and his faithful housekeeper, alongside Gordon Harker in the comic role of the surly servant Churdles Ash. Prior to filming, it was reported that Cedric Hardwicke, who had played the role of Churdles in the stage play, would appear in the film. The only actor to be carried over from the London stage play was Maud Gill as the spinster Thirza Tapper. Production began in October 1927 with extensive location shooting in the Devon, Somerset and Surrey countryside. In the weeks before filming commenced, local newspapers reported that Eden Phillpotts had "personally chosen the locations for the film". A few months later, Hitchcock returned to Surrey to buy a weekend country retreat, eventually settling on Winter's Grace in the quiet Surrey village of Shamley Green. The Western Daily Press reported in early October that Hitchcock was filming in Minehead, Somerset, and had told their journalist that "more of the west country scenery would be introduced, and that beauty spots in the district would be visited to acquire the background for a film which would be representative of old English country life." With location filming completed, the production moved back to Elstree to film interiors. In early December, Mrs Lucy Baldwin, wife of the British Prime Minister Stanley Baldwin, visited Elstree Studios and saw Hitchcock at work on the film. Some sources state that cinematographer Jack E. Cox fell ill during production and Hitchcock took over the camera for some of the filming. According to Donald Spoto, the end of filming was celebrated at a London restaurant where Hitchcock played a practical joke on the cast and crew — the waiters had all been replaced by actors who had been instructed to be as rude and clumsy as possible. The film received an early trade screening at London Imperial Institute on 12th July 1928 before opening at the Regal Marble Arch Cinema in London on 11th February 1929. As Hitchcock and Stannard had been relatively faithful to the popular stage play, reviews of the film were largely positive. The Stage noted that "Alfred Hitchcock, if he is not always entirely successful, has achieved an outstanding film." Although the reviewer felt that Thomas and Hall-Davis lacked something in their performance, "Gordon Harker's portrayal of the old philosopher Churdles is a thing of joy. It is one of the best and most natural studies seen on the screen." Whilst the Perth Western Mail praised the Devonshire countryside, the reviewer bemoaned the overuse of slap-stick, "for instance, the business with Gordon Harker's beltless trousers, which too frequently show signs of coming down". Incidentally, it has always seemed to me to be rather a waste of Harker's talents that he should almost invariably be cast as a Cockney. He is a brilliant character actor, and perhaps you'll remember that I gave him the role of a Devon farmhand in The Farmer's Wife. He made a very good job of it. This was in certain respects a tragic film, for tragedy came to two of the leading players in it. The star of the picture was Jameson Thomas. He had, of course, been in numerous films before this, and he was undoubtedly one of England's most popular players. He is in Hollywood today, playing supporting roles. He left England to take his wife to California. She was very ill. The Californian sunshine seemed to offer the only hopes of a cure. So Jimmy Thomas packed up everything in this country and moved to Hollywood — in vain. His wife died in spite of the sacrifice. Thomas's leading lady in The Farmer's Wife was Lillian Hall-Davis. She was an amazing girl. On the set she suffered from acute self-consciousness. She had an acute inferiority complex in regard to her ability to play certain parts, and I remember that she turned down an extremely good role because she wasn't sure she could do it well enough. Actually, she could have played it with ease. Yet, in private life she was an altogether different person. She possessed a terrific personality, and amazing vivacity. It was with the deepest regret that, two or three years ago, I read of her death in tragic circumstances. In 2002, Thomas M. Leitch summarised the film as having a "warmth and sweetness unprecedented in Hitchcock's work and unrivaled in any of his later films before The Trouble with Harry, whose tone is also softened by its rustic setting." 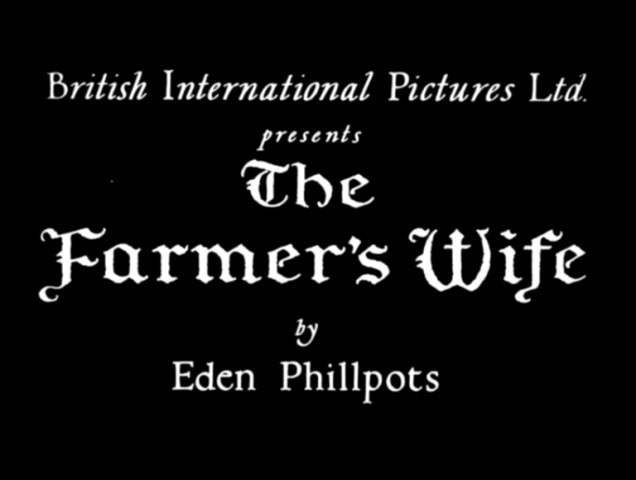 As part of the "Save the Hitchcock 9" campaign, started in 2010, the British Film Institute undertook a full restoration of The Farmer's Wife. The original camera negatives no longer exist and acetate duplicating positives made in the 1960s from the negatives are now the earliest-generation sources. ↑ English Hitchcock (2000) by Charles Barr, page 223. Barr reports the number of performances at the Court Theatre as being 1,324, but most contemporary newspaper reports state 1,329.